If The God's Eye View had been released even three or four years earlier, it might have carried with it the weight of a technothriller fueled solely by paranoid delusion and conspiracy fluff. In the wake of Edward Snowden's revelations regarding the government's mass surveillance of American citizens, though, this book reads frighteningly realistic. 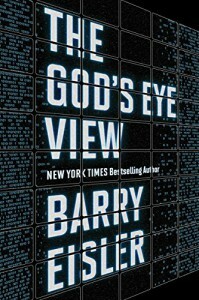 And although the titular NSA surveillance mechanism codenamed God's Eye is supposedly a fictional product of Barry Eisler's authorial creativity, reading this book might prompt more than a few raised eyebrows wondering, "Can they really do that? Are they doing that right now?!" The God's Eye View has a good amount of stuff happening all at once - there's whistleblowers in danger, an NSA tech who asks one too many questions of her superior and finds herself marked for death, that superior being the crazed director of NSA who is willing to go to extraordinary lengths to secure power under the auspices of protecting the American people, and a couple freelance hitmen dealing out the hurt to whoever the director points the finger at. One of these hitmen is Manus, a brilliantly drawn and conflicted killer (which, let's face it, is practically an Eisler trademark at this point) who is hearing impaired. When tasked with monitoring Eve, the NSA tech who comes across video surveillance of a government whistle-blower leaking info to an Intercept reporter, his life becomes far more complicated with the discovery that Eve's son is also deaf. There's a few things I expect in a Barry Eisler book - a sound display of spy trade craft, egregious government overreach, brutal violence, and an uncomfortable level of realism when it comes to depicting covert agencies gone berserk and the lengths the smart and skilled protagonists will go to in order to protect themselves. All of these elements are on display in The God's Eye View, so count me as a happy camper. If I have to provide a negative to the work, it comes in the novel's opening chapters where so much of the dialogue feels like an exercise in blatant info-dumping and name-dropping to get readers caught up on the real-world events that have inspired this book. Granted, it's all done in an effort to ground the book in a firmly recognizable landscape of modern post-Snowden America, and those who are a little less up on recent events might not be bothered. Those that have been following along with the Snowden leaks, Greenwald's reporting, and the Electronic Frontier Foundation might get a little itchy for the action to start hitting. But when that action does hit? 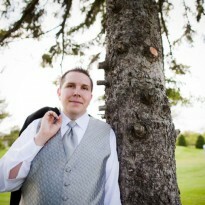 Man, oh, man. You're in for some good stuff. The God's Eye View is a great thriller filled with well-realized characters and a frenetic pace. It also gives an uncomfortably realistic, and frighteningly prescient, view of the NSA's capabilities and the loss of privacy threatening every American. Highly recommended.